These skeins show the difference between premordanting and being treated to a mordant afterbath. All were dyed with dyer’s polypore, Phaeolus schweinitzii. The two on the left were treated with iron; the darker one was premordanted, while the lighter one sat in an iron afterbath for about thirty minutes. 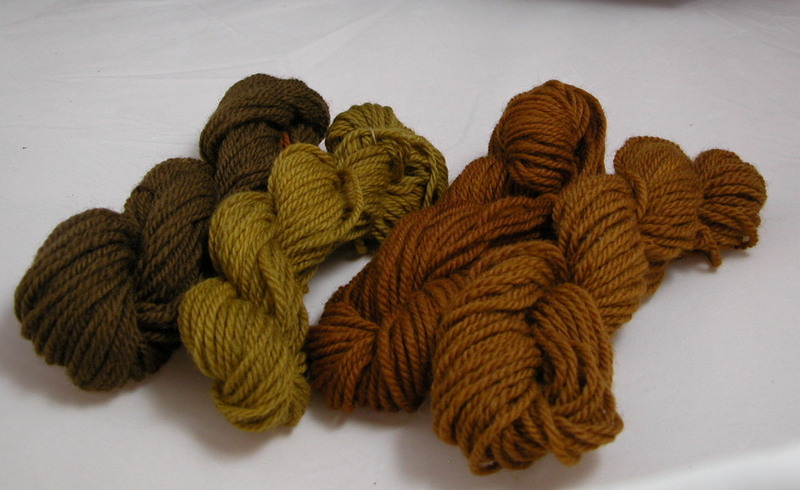 The brown skeins were treated with copper; again, the darker one on the left was mordanted before dyeing, while the lighter one was immersed in a copper afterbath. Care must be taken not to use too strong a mordant solution, as I understand it can damage the fibres over time. I premordanted the skeins by weighing the fibre and using about 7% of that weight when measuring out the mordant, plus an equal amount of cream of tartar. The afterbaths were made with a quarter teaspoon of mordant dissolved in three cups of boiling water. I’m keeping the solutions in labelled jars, should I want to use them as afterbaths again. 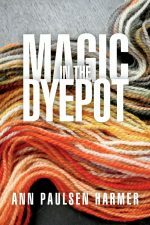 I often mordant in the pot to save time. I plan to experiment to see if that makes as drastic of a difference, with iron. I love your experiments! !